SCOTT Fenwick believes his career is on the right road after getting a second chance to be a professional footballer. The new Hartlepool United striker’s first crack ended before it had even begun – Gretna going out of business with the then teenager returning to his native Tyneside. Having failed to be kept on at either his beloved Newcastle United or, whisper this, Sunderland in spells in their academies, there was only one thing for it – Fenwick got a job. The Gateshead-born striker became a civil engineer and enjoyed his day job while spending Saturday afternoons and Tuesday nights indulging in his first love, football ... and scoring goals. Fenwick has attracted interest, especially this season, going on trial to Sheffield United. He impressed at the Bramall Lane outfit, scoring four times on trial. The 24-year-old was seemingly faced with a dilemma – football or civil engineering. He chose the day job. “I had a good job,” he told SportMail. “I got a bit of an ultimatum off my boss – concentrate on civil engineering or go and play football. “There were a lot of things to take into consideration, so I stuck with the job. “I got my degree in the summer so I’ve got my qualifications. “But when this opportunity at Hartlepool came along everything felt right about it. 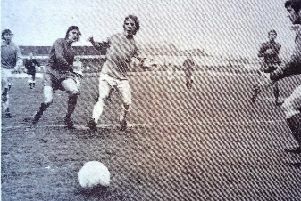 “I came on trial and scoring [twice] in the reserves helped. Fenwick spent six years at Newcastle’s academy as a boy, had a few months at Boro and a season at Sunderland. It did not work out for him, nor did his move to Gretna, where his stay started and ended at the age of 19. But Fenwick got a trade behind him, which, you imagine, could stand him in good stead at some point in the future. The former Dunston UTS goal-getter has no intention of going back – he feels he’s on the right road with Pools. “I think we’re in a false position,” he said. “We definitely have enough quality.